Throughout July women from around Solomon Islands came together for a series of workshops to share how they were affected by the period of violence known as “the tensions” and their recommendations for the government. After the workshops, five women formed a writing group and compiled the women’s stories into a submission to the TRC. This submission is officially being handed over to the TRC on Monday, October 31, 2011. The handover is scheduled to take place at the TRC leaf hut at 2pm. Please feel free to attend to get your copy of the submission or its pictorial version. The Solomon Islands, located just east of Papua New Guinea in the Pacific Ocean, consist of nearly a thousand islands divided into eight different provinces, each with its own unique culture. The Solomon Islands gained independence from Britain in 1978, and successive governments have struggled to unite the country and develop a sense of national identity. Twenty years after independence, violence erupted in Guadalcanal (where the capital is situated) around land ownership and ethnic allegiance, causing thousands to be displaced. Militant groups were organized and the conflict continued during a period now called “the tensions,” from 1998 to 2003. The Solomon Islands government which took office in December 2007 made national reconciliation its top priority, including the establishment of a truth and reconciliation commission (TRC) to shed light on past wrongdoings. The work of the TRC officially commenced on January 15, 2010. 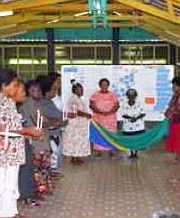 Photo: Throughout July 2001, ICTJ's Solomon Islands program conducted workshops with women around the country in an effort to facilitate a space for them to create a women's submission to the TRC.